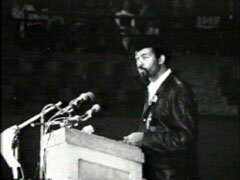 Eldridge Cleaver joins the Black Panther Party. The home of Eldridge & Kathleen Cleaver is raided and searched - this without a warrant. Cleaver is wounded during a shootout with police [Bobby Hutton is killed] and is returned to prison on a parole violation. Cleaver is released from Vacaville prison for the parole violation. Cleaver goes to the United Nations to plead the Black Panther case of human rights violations. Cleaver runs for President of the United States under the banner of the Peace and Freedom Party. Cleaver disappears; he was to turn himself in to complete his 1958 assault sentence; flees with wife Kathleen to Cuba, Paris and Algeria. Cleaver and wife Kathleen return to the United States to face their charges. 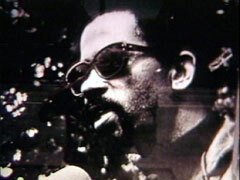 Eldridge Cleaver became one of the best-known Black Panthers. In 1958, he was imprisoned for assault with intent to kill, was paroled in 1966 and became senior editor for Ramparts magazine. In 1967 he joined the Black Panther Party. After a turbulent year and a half with the Panthers as their Minister of Information, Cleaver and his wife Kathleen fled the country to avoid Eldridge's return to prison on a 1958 assault conviction. While in exile in Algeria, the FBI created a rift between Cleaver and Newton and the two began a mistaken battle for control of the party. Cleaver threw Newton & Seale out of the party; Newton threw Cleaver out of the party, and so on. Late in his life, Cleaver renounced violence within revolution and began a battle against communism ideals, based on his experiences living in communist nations. Eldridge Cleaver on the Tuning into the Power Structure, at the BPP Office in Oakland.